A Production Operator for Downers at BMA Blackwater Mine. A: I currently live in Gympie but travel to Blackwater for work. Q: Can you explain what your role entails? A: I am a Truck Operator. Q: What sparked your interest to work in the resources sector? A: I was always interested in the industry due to growing up in Moranbah a mining town in Central QLD and my dad working in the local mine. Q: Was there someone/something that inspired you to pursue your current career? A: After being in the industry approx 7 years now and starting as a cleaner on-site I always saw other career opportunities and went for them from cleaner to trainee operator to pumpie to IROC mine controller and currently back to site as an operator. Therefore I would say the opportunities are endless in the resource industry. Q: Can you explain the pathway you took to your current job? 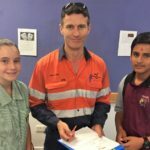 A: I was successful in gaining an Indigenous Traineeship at BMA Blackwater, this is where my mining operator career started. Q: What challenges do you face in your job? A: All jobs have different challenges one of mine personally is making time for work and family as I have two children so work/home life balance is an everyday challenge which I have now mastered. 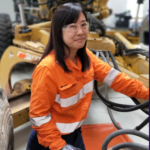 A: I enjoy being on site hence the reason I am going back to being an operator at Blackwater mine and have just resigned from being a Mine Controller for BHP in Brisbane. Q: What has been your experience being a female employed in the resources sector? A: I have always had good experiences being female in our industry, the culture has definitely changed and is still changing in leaps and bounds and I am very proud to be an indigenous woman helping to make those changes happen. Q: If there was one key message that you would leave with students considering a career in the resources sector, what would it be? A: Don’t let the unknown scare you, go for it and give it 110% and be proud of yourself!!! !